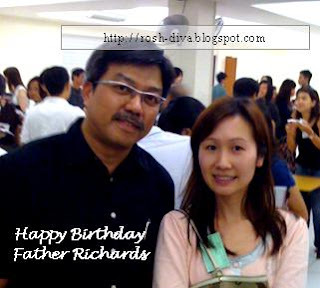 Happy Birthday Father Richards! May God's blessing pour upon you. His RCIA classes are very enriching. Even my parents want to do a re-course because it's conducted by him. He is the only priest that will conduct RCIA lessons in S’pore (I think). There are about 300 pax in one single class. I am in group H for the rest of the year. I will forgo my company’s movie night to attend his Thursday class. Such a good student hor. I think there isn’t any exams or paper to submit in order to graduate though I hope they will consider one. I kinda miss writing my 3500 word essays in school. You can write one now. I give you essay topic. "What's so different between the Modern churches and Catholic churches? And should modern churches charge 10% commission of people's salary?"